It's Minecart Rush new Release!!! 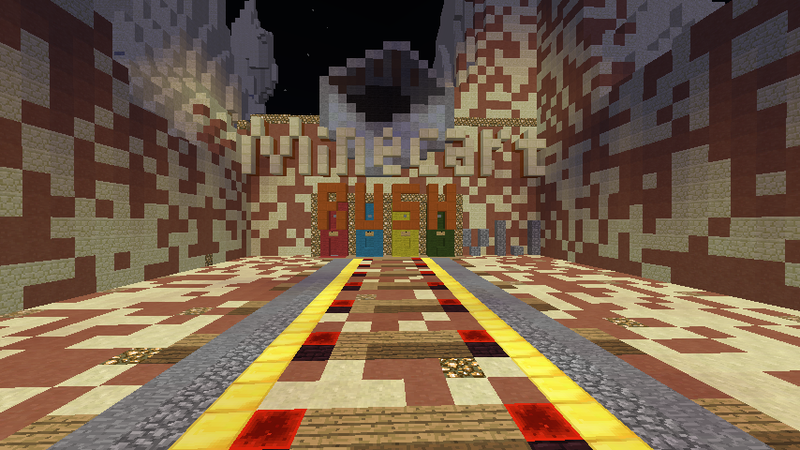 MinecartRush is a PVE mob arena map. Mobs will sitting in a minecart coming from portals,you dont have to kill them all, after a minute then they would all get teleport to hell. Some very strong bosses would come every 8 waves with his minions. Defeat the wave 32 boss RedstoneSkeleton to win the game. You will lose the game if you died with negative amounts of gold. In mutiplayer you will just switch to spectator mode and will never turn back. Note: There might still be some bugs in this game, report it in the comment if you find one, Thanks alot. And there is a double gold bug with mutiplayer for now, just uploaded a fixed version. Please download it again. Run around an arena, fighting mobs in minecarts. Visuals are ok - a large rectangular room, but some attempt to use mixed colors and decorate the light posts. From a game mechanic, I only played single player, and feel there were too many mobs coming from too many directions. Had difficulty getting near skeletons to hit them, until I realized I could just stand at one of the portals and spawn-camp mobs as soon as they appear. Seems like shops need a bit of work, and the game glitched out during wave 8 boss. I would start with non-ranged mobs. I'm just getting shot and can't get near skellies. Arena feels too big (for 1 player). I can't see everything coming at me from 4 sides so I'm just focusing on one portal. I was able to run up to the portal and just camp it, killing mobs as soon as they appear. Bought a bow in the shop, it had super low durability! I don't like the automatic slime poison in the wave 8 boss - too punishing even if you're on the complete other side of the arena from any slimes. During wave 8 boss fight I was suddenly put into spectator mode - no idea why. I switched back to adventure mode until my sword was broken and I was out of arrows, then went into creative and killed his slime. Then back to adventure and punched the boss to death. Nothing happened. 1.Wave 8 Boss is not glitched out, you will lose when dying with negative gold.The death messaage seems to be broken.You have to reload the map after losing the game,and choose a easier difficulty. 2.You can't spawn-camp mobs after creeper/slime appears,especially for those high lvl mobs (Squid,Witch,Black Sheep,Villager). also spawncamping gives you less gold. 3.Skeletons are major characters in the game,There will be skeletons in all 32 waves,The final boss is also skeleton. Really hope you can try again,theres too many custom mobs with special skills you havent met. EDIT: Just figured out that file explorer won't work. 7-Zip seemed to do the trick though. EDIT 2: Is the redstone skeleton meant to be killable? I killed all his minions, but broke all my weapons trying to kill it. Generation 38: The first time you see this,copy it into your signature on any forum and add one generation. This is a social experiment. I Build this parkour/Maze World! 1 Day. I am Turkish. Download world here! Looks cool! I'll try it out.